Lasizwe Dambuza (also known as Babes Wamaleyvels) reveals a different side to what Mzansi has come to know through his social media posts. He juggles his time between making business decisions, preparing for some of the country's fancy social events, addressing one of the controversies surrounding him and striving to bring his family together. There is drama, controversy and tears, which will expose Lasizwe's sensitive side – something rarely seen in his social media life. Property and interior design guru Kirstie Allsopp helps people transform their homes with furniture that's been sourced for free, showing that second-hand is definitely not second best. By enlisting the help of salvage expert and designer Charis Williams, inventor and furniture hacker Max McMurdo and artist and up-cycler Lee Baker, Kirstie proves that with some savvy sourcing and clever up-cycling ideas, achieving a new look in your home can be done for a lot less than it would to buy new. Kirstie takes on the challenge of transforming two homes in each episode, without spending any money. She wants to show how simple it can be to transform, repair and give a new lease on life to once loved furniture, without compromising on style. Emmy Award-winning journalist Tony Harris reveals the different faces and places behind the crimes and the worlds that surround them. He examines the 1990 case of three prostitutes killed in Washington. Was it the work of a serial killer? And in Salt Lake City, Utah, he unravels a vicious cold case of a 78-year-old woman murdered in her home which hinges on the Lego blocks strewn across the floor. This series explores the secret world of family betrayals, conspiracy theorists and violent crimes. Frank Reagan (Tom Selleck) is the New York City Police Commissioner and heads both the police force and the Reagan brood. He runs his department as diplomatically as he runs his family, even when dealing with the politics that plagued his unapologetically bold father, Henry, during his stint as Chief. A source of pride and concern for Frank is his eldest son Danny (Donnie Wahlberg), a seasoned detective, family man, and Iraqi War vet who on occasion uses dubious tactics to solve cases. The sole Reagan woman in the family, Erin (Bridget Moynahan), is a N.Y. Assistant D.A. and newly single parent, who also serves as the legal compass for her siblings and father. 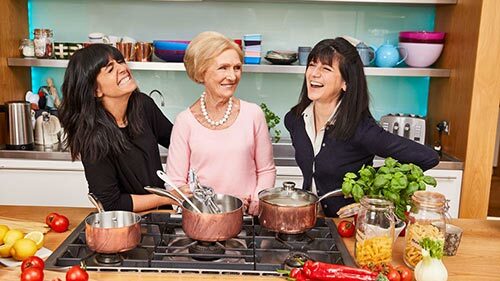 The search is on for Britain's Best Home Cook, judged by the queen of home cooking Mary Berry, produce expert Chris Bavin, top chef Dan Doherty, and hosted with wit and warmth by Claudia Winkleman. This is the ultimate immersive cooking competition with home at its heart, bringing 10 passionate home cooks from across the country together to live in a shared house while they compete for the crown. Over the weeks they will face a comprehensive range of culinary challenges, from fabulous feasts to the nation's favourite dishes, and all things in between. How I Made My Millions goes behind the curtain to reveal how everyday people have taken ordinary ideas and turned them in extraordinary businesses, surpassing the magic number of $1-million. Each of these entrepreneurs took a risk, believed in their dream and, thanks to a lot of hard work and a little luck, became millionaires. The Season 2 premiere features the companies SimplyShe, a women's lifestyle brand; the moving company Two Men and A Truck; and Vita Coco, a coconut drink. Architect George Clarke is "The Restoration Man" and he travels the length and breadth of the UK to help people from all walks of life transform some of Britain's neglected historic buildings into stunning and unique homes. In each episode George follows the build from the outset and watches the restoration project develop to completion - which can often take well over a year. As an architect, he offers these brave restorers valuable design and architectural advice, and follows them every step of the way, lending a hand when things get tough, and uncovering the fascinating history hidden in the very fabric of each building. Revolves around three families – the Lebones, the van Reenens and the Tladis - who, because of past conflicts, struggle to negotiate a cohesive future, despite being bound together by their relationship to a special piece of land. Because of past conflicts, these families struggle to negotiate a cohesive future, but the families are bound together because of their relationship to a special piece of land. This is also where you will find an exclusive lodge renowned for its fine dining, expensive champagne, pampering sessions, game drives at sunset and private chalets.